Pass lab Yamagata Wyverns (B2 League) agreed terms with 32-year old American (has also Panamanian passport) forward Gyno Pomare (203-86, college: San Diego). He started the season at Shimane Susanoo Magic. In 10 B2 League games in Japan he had very impressive stats: 15.2ppg, 9.9rpg, 3.6apg, 1.6spg and 2.3bpg this season. Good year as he was named League Player of the Week. 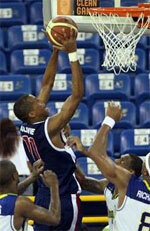 The last season Pomare played at Osaka Evessa (B League) where in 29 games he recorded 11.5ppg, 7.4rpg and 1.7apg. Pomare played in the final of Japanese BJ League Western Division in 2013. He represented Panama at the Central American and Caribbean Games in Mayaguez (Puerto Rico) nine years ago. His stats at that event were 4 games: 9.5ppg, Reb-5 (10.3rpg), 1.0apg, FGP: 50.0%. Pomare's career allowed him to visit three different continents. He tasted the life as pro basketball player in Asia, Latin America and of course North America. Pomare has played previously professionally also in Argentina (Quilmes Mar del Plata), Romania and Japan (Iwate Big Bulls, Sendai 89ers, Kyoto Hannaryz, Aomori Watts and Kanazawa Samuraiz). 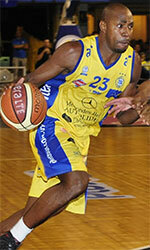 He attended University of San Diego until 2009 and it is his tenth season as a professional player.